Just like the vast majority of our clients, the chances are you are busy, and fitting in exercise into your schedule can be challenging. 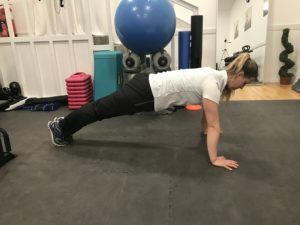 Here at Luke Bremner Fitness we try to make things as simple and convenient as possible for all our clients and in today’s blog post we have a solution for you – an effective, full-body, metabolism-boosting, fat-burning workout that can be completed in under 25 minutes! 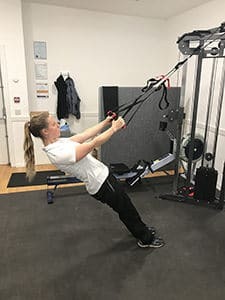 This workout can be completed in a gym or at home (or even outdoors) with just a few basic pieces of fitness equipment: an exercise ball; a selection of light-medium dumbbells; and a TRX suspension trainer (or similar). 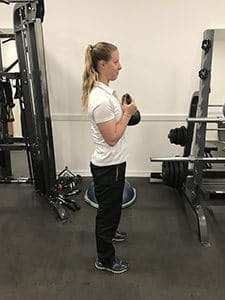 We use a kettlebell for one of the exercises shown below, but that could just as easily be done with a dumbbell if a kettlebell is not available. 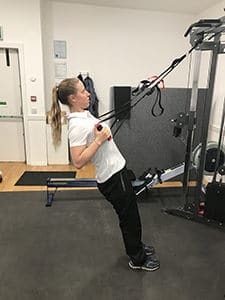 Where possible, perform all the exercises back-to-back as a circuit, with the aim of completing 3-4 rounds (fitness level and time-dependent, of course!). We recommend around 40-45 seconds of effort per exercise, with 15-20 seconds of rest between exercises. Aim for 60-90 seconds complete rest (or until you feel ready to go again) in between circuits. The above instructions are of course guidelines and you can tailor the time-frames to suit your goals and fitness level. 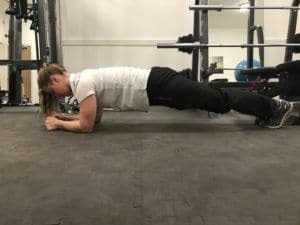 You should also be medically cleared to perform this workout, so please do not attempt if you are brand new to exercise, are injured or have a medical condition that may impact your ability to exercise safely. Teaching Points: Hold the kettlebell/dumbell close to your chest with elbows tucked in. Brace your core and begin to drive your knees outwards as you sink down between them with your hips. Aim to keep your torso upright, your knees in line with your toes, the weight in the heels, and try not to let your knees extend beyond your toes. Teaching Points: Take your hands a little wider than shoulder width, and approximately in line with your shoulders. Brace your core, engage your shoulder blades, and lower yourself towards the ground under control before returning to the start. The elbows should be approximately 45 degrees from your side during the movement. 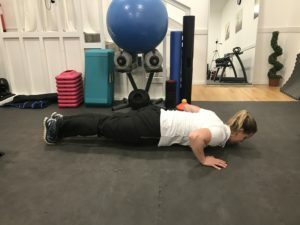 The knee version is easier for those struggling to complete a full press-up (they are hard!). Teaching Points: Lie flat on the ground and rest your feet on top of a swiss ball. Brace your core and raise your hips off the ground so your body is in a straight line. When you are stable, dig the heels into the ball and drag it towards your buttocks, raising the hips (if you can) as you do so. Teaching Points: Take a grip of the handles and take up the slack. With arms extended, begin to walk your feet forward to create an angle (the steeper you go the trickier it is). Brace your core, stabilise your shoulder blades and then pull yourself upwards, extending your elbows behind you. Squeeze the shoulder blades and back muscles at the top, before slowly lowering yourself back to the start position under control, maintaining tension in the back as you do so. 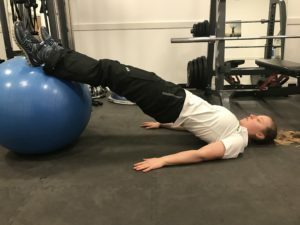 Teaching Points: Maintaining tension in your core muscles throughout, hold yourself in a straight line, with only your elbows and toes on the ground and a straight line through your shoulder, hip, and ankle . The key of this exercise is to maintain a flat back, and ensure the pelvis does not tilt forward (which would cause a dip in your low back). 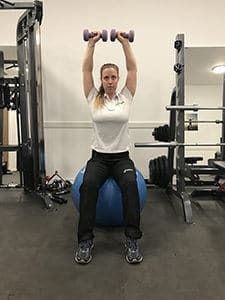 Teaching Points: Sitting up tall on the middle of a swiss ball, with a braced core, press the dumbbells from the side of your ears to the top of your head. The forearms should remain close to vertical throughout, and knees should be bent at 90 degrees. 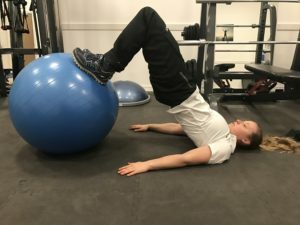 The key to this exercise is being properly balanced on the ball, which is a core workout in itself! After you’ve completed all 6 exercises, rest 60s-90s before starting again, and aim for 3-4 complete rounds (exercises 1-6) of the circuit for optimal results. This whole workout (including a 5 minute warm-up) can be completed in less than 25 minutes. Now there’s no excuses now for not squeezing exercise in to your busy day we hope this workout comes in useful when you’re pushed for time. Enjoy! Weight training forms the foundation of all our exercise programmes here at Luke Bremner Fitness. This is because weight training, in combination with a healthy eating plan, is the quickest way to lose weight, change your body shape, increase your strength, posture, and metabolism. 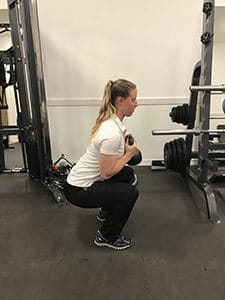 However, we do understand weight training can be intimidating and confusing, with many people simply not knowing where to start, or being unsure about doing so. 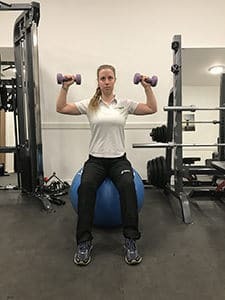 If you’d like to learn more about weight training and how it can benefit you, along with what we do here at our private personal training studio, you’re welcome to book in for your complimentary consultation. You can do so by clicking the link below.